Since Ole Gunnar Solskjær’s return to Manchester United, the club have won six games in a row, whilst keeping clean-sheets in their last three fixtures, shutting out Newcastle, Reading and Tottenham despite playing a more attacking brand of football than José Mourinho did before him. After Solskjær’s United cruised to victory, 5-1 to be exact, away at Cardiff in his first game in charge, many had blamed the poor opposition and this excuse followed after a 3-1 win against Huddersfield, a 4-1 win against Bournemouth and 2-0 victories against Reading and Newcastle. However, United’s victory at Wembley versus an in-form Tottenham side has shown that Solskjær has not been riding his luck against struggling sides, but much more than that. This, coming after the United squad had spent over two years hearing their manager publicly slamming them and refusing to accept any responsibility for results and performances, whilst also diminishing the romanticism of Manchester United – particularly in his ‘football heritage’ rant – would have a much-needed morale boost after confidence had hit rock-bottom. Solskjær had also brought the most talented and influential player at his disposal, Pogba, out ‘from the shadows’ as the Frenchman described himself after Mourinho had banished him to the sidelines and had questioned his commitment to the club. What Ince fails to realise is that not ‘anyone’, especially himself, is as loved at United as Solskjær is. Nor would Ince, or Bruce, say the things that Solskjær has and even if they did, their words wouldn’t carry as much credibility as his, who gives off the impression that he feels extremely honoured to be in his current position and genuinely wants to improve each individual wearing the badge. The upturn in form hasn’t just been about improving the mood, though. Backed up by Michael Carrick, Kieran McKenna, Mike Phelan and Emilio Alvarez, Solskjær has already significantly improved United’s playing style and removed flaws in individuals that had resulted in conceding goals. They have also proved that they can create a plan for a big-game and carry it out, one that doesn’t involve a six-man defence and hoping for the best on the counter. As Solskjær has previously said, he prefers to concentrate on United’s strengths rather than the oppositions, a contrasting approach to Mourinho whose defensive set-up had Martial tracking back so much against West Ham in September, the Frenchman turned to Pablo Zabaleta and asked the-then 32-year-old how old he was. The win at Wembley had shown that Solskjær stayed true to his word. During the mid-season training camp in Dubai, United are said to have worked on Lingard playing in between the lines in a false-9 role with Martial and Rashford playing high and wide. Lingard had a responsibility to halter Harry Winks’s influence on the game whilst Pogba, naturally – given his passing ability – was the one given the task to find Martial or Rashford with diagonal balls in-behind the space Tottenham’s full-backs had vacated, with Solskjær trusting Martial and Rashford to have Spurs’ centre-backs for pace. It worked a minute before the half-time interval and highlighted that the players were finally being coached whilst also winning games. Of course, without David De Gea’s second-half heroics, the praise for United’s coaching staff may have been non-existent, but even the Spaniard’s shot-stopping masterclass was a credit to Solskjær as the Red Devils number one had been having a season to forget going on his usual extraordinary-self but has now kept two clean sheets from United’s last two Premier League games – Newcastle (a) and Tottenham (a). Solskjær and his coaching team had found Mauricio Pochettino’s side weaknesses and exploited them using the strengths of his squad. In contrast, Mourinho would belate the board for not backing him by signing a central defender after disappointing results to mid-table or relegation fighting clubs. Before Mourinho’s dismissal, it seems January was going to be massive for United and multiple new recruits would be needed, however with the Portuguese now relieved of his duties and Solskjær at the wheel, relaxation about signings has entered most United fans’ thoughts as rational buying would only inflate prices of potential targets in mid-season whilst also providing a tougher implementation period for any new signing, as Alexis Sánchez has found out. Instead, Solskjær is improving players already at the club, and the support for players has increased. You only have to go back to December 15th, when news of Chris Smalling’s contract extension, a supposed early Christmas present, was greeted with heavy criticism, with one Twitter user, @JustNathanMate even tweeting ‘We could lose 10-0 tomorrow [against Liverpool] and this would still be the worst news of the weekend’. Eric Bailly and Antonio Valencia were among those who had been frozen out altogether, Pogba was watching from the bench and an exit in January was looking likely and even Mourinho’s warriors, such as Nemanja Matić, didn’t seem too bothered about playing for the manager. Solskjær didn’t walk into a job where all he needed to do was praise players and results would come. The squad was lacking any style of play, a best starting eleven still wasn’t known, players were considering their future with multiple stars refusing to commit to new contracts and any chances of finishing in the top four seemed distant. But all has changed. Matić, perhaps United’s most under-performing player this season until Solskjær’s arrival, is now beginning to play forward and do so quicker than before whilst also tracking runners. Pogba, who’s showboating and overcomplicating of the game had caused himself and United problems this season, is now releasing the ball quicker and with runners in behind, he has more options ahead of him. The need for a central-defender seemed like an emergency yet Lindelöf, Jones, Bailly and Smalling no longer look like walking mistakes. Lukaku, who seemed to have no sense of shame in his appaling performances and was giving interviews laughing at his critics yet has now been made to watch Rashford excel from a sideline view on the United bench, which has given United fluidity and stretched opposition defences. United were at the point where their best players were keeping their eyes wide open for possible destinations they could move to. De Gea, Pogba and Martial were three who’s future at the club didn’t seem to be lasting much longer and the scene had become as though playing for the club was hell and no longer appealing. The standards had dropped playing at United. You didn’t need to give your all, it was usual for the opposition to cover more distance, have more shots, enjoy more possession. Even at Old Trafford. Standards are set by the manager. Mourinho would turn up on matchdays in a club tracksuit, reminiscent of Tony Pulis, with bags under his eyes, hair all over the place, ready to get in pre-match excuses in. He also continued to live in the Lowry Hotel that was being paid for by the club, rather than buying a property in Manchester. Heck, he even turned up at the Munich memorial wearing a hoodie underneath an unbuttoned blazer and on his feet were a pair of trainers which reportedly left club officials ‘appalled’. Solskjær, however, has re-introduced Sir Alex Ferguson’s rule of wearing suits upon arriving at games. Not only that, he has reminded the players of the importance of playing for the badge, how lucky they are to be playing for Manchester United and the responsibilities they have in doing so. Even Martial, usually alien to doing interviews, has said this week that Solskjær ‘told us about the tricks he picked up as a player and how lucky we are to be part of Manchester United’. Whatever happens for the remainder of Solskjær’s spell in charge of United, his current impact has been much more than just ‘improving the mood’. 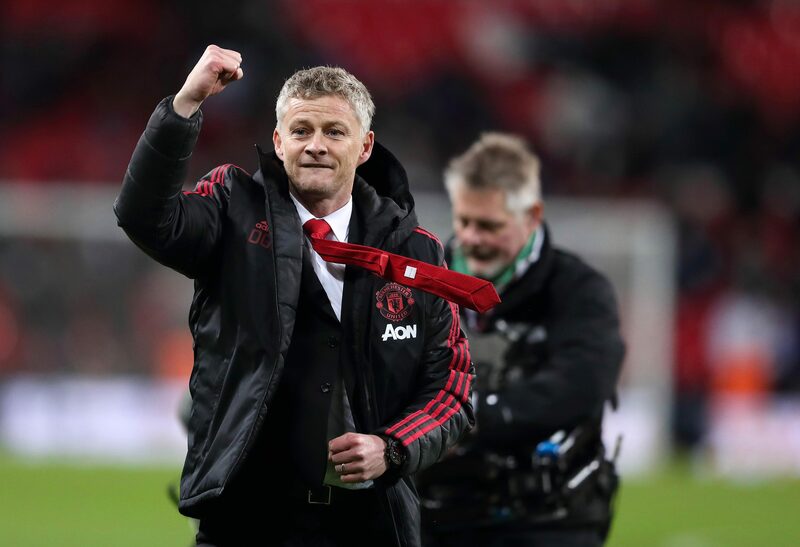 The 45-year-old understands the club and places importance on developing the players, rather than sacrificing enjoyment for results, so far, Solskjær has delivered both. Though still sixth in the league, from an entertainment perspective, it’s arguably the best United have been since 2013. Fans are counting down days until the next fixture, new songs are being created, and if the club was ever going to feel like it was back to the days of Sir Alex Ferguson’s reign, now may be the closest we’ll get.